Conductor Allan R. Scott hosts Morning Classics (and an occasional Free Forms show) several times every month. He is also the Music Director of the Helena Symphony Orchestra & Chorale (since 2003), Philadelphia’s Southeastern Pennsylvania Symphony Orchestra (since 2002), and Principal Conductor of the Wilmington Ballet Company (since 2009) in Delaware. SYMPHONY Magazine noted him as one of the most exciting Music Directors in the country, and his performances have been praised by The Associated Press, National Public Radio of New Zealand, and critics around the country. In addition to his work as Music Director, he guest conducts orchestras, ballet, and opera throughout the world. Quiz: How Well Do You Know Leonard Bernstein? We're celebrating the life and music of Leonard Bernstein on MTPR this week. 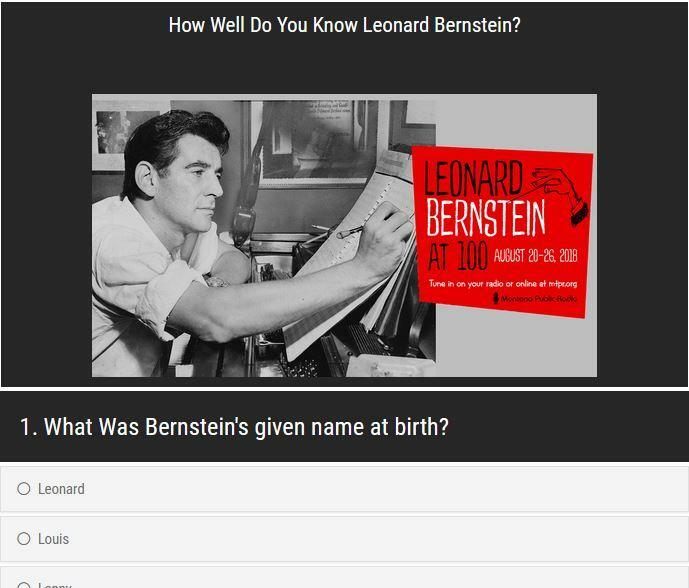 How well do you know Bernstein? Take our Leonard Bernstein quiz to put your knowledge to the test.